Modern music can make people uncomfortable with its dissonance, foreign musical vocabulary and sometimes-puzzling intent. But when an entire concert series is dedicated to the performance of contemporary music, a certain shift occurs. The people who attend have chosen to leave their comfort zones, to try something new. This is what I enjoy about Los Angeles Philharmonic's Green Umbrella concerts: the feeling of being in Disney Hall with thousands of people who are prepared to listen with open ears and minds, to something they know will challenge their senses. Tuesday night's Green Umbrella concert featured quite a few violin soloists: guest artist Jennifer Koh, as well as LA Phil violinists Nathan Cole and Bing Wang. Other featured soloists were LA Phil trombonist James Miller and soprano Charlotte Hellekant. The concert included works by Luigi Nono, Luca Francesconi, Luciano Berio and Giacinto Scelsi. As expected, the music challenged the ear, questioned convention, and at times defied explanation. The lights dimmed for Luigi Nono's "'Hay que caminar' soñando" for two violins, leaving violinists Nathan Cole and Bing Wang each in their own spotlight at the center-front of the stage, surrounded with a pool of dim green light (a signature of the LA Phil's "Green Umbrella" concerts). The piece began with quiet harmonics, dog-whistle high, at times reminiscent of the high end of a hearing test. These were punctuated occasionally by soft outbursts, often in a whispery sul ponticello. The tapestry of this did not change much throughout the 20-minute piece. I came to understand that the silence was as much a part of this piece as was the sound; the audience's shuffling, low throat-clearing and a few naughty cell phones were as audible as the music. The program notes describe the piece as one of many meditations the composer wrote, inspired by an inscription on the wall of a Spanish monastery: "Caminante, no hay caminos, hay que caminar," or "Wayfarer, there are no paths, (yet) you must walk." To that end, the soloists several times walked to other music stands, set up in different locations in the hall. First they walked in silence to opposite corners of the stage, the light changing as the spotlights shifted to follow each of them. They continued with the same static sound, high harmonics with fuzzy-soft gestures. Then they moved even farther away, climbing stairs on either side of the stage until both stood above and behind the vacant, green-lit stage, playing yet the same high-pitched fragments. The empty stage, low light, feeble volume, thin threads of sound in the highest register played by just two violinists -- all created a feeling of desolation and withdrawal, like standing alone at night on the North Pole, listening for ice to crack. Now and then a creature might scamper across the cold landscape, or an aurora might light the sky, but mostly it was quiet. Remarkable to create such strong feelings of stillness and isolation in a hall filled with several thousand people. Next was "Animus" for trombone and electronics, by Luca Francesconi. Again, only two people stood on stage: LA Phil trombonist James Miller and Matthew Davis, who operated the computer and sound board that was set out on a black table. The piece began with a windy "whoosh" -- like a rush of air through a giant trombone. In fact, this may have been what it was, the amplified sound of breath through instrument, made to go "waba-waba" with a mute and electronic enhancement. For a long time the trombone produced no notes; only wind and small gurgles -- a sound one might imagine coming from a microphone in someone's small intestine. The trombone sounds morphed into something more pitch-oriented, swirling and growing loud. The musical figures that Miller played seemed to follow him around and change shape and color -- like memories, brought back by Miller's loop pedal. Some "memories" grew menacing as they rushed past, others simply became more colorful. It seemed a virtuoso on-the-spot pairing of live, pre-recorded and looped sound by Miller and Davis. Many in the audience gave the performance a standing ovation. For the U.S. premiere of "Calmo" by Luciano Berio, soprano Charlotte Hellekant stepped onto stage with bare feet, adorned with jingle bells around both wrists and ankles. She was accompanied by a small ensemble, conducted by Gustavo Dudamel. The piece, written after the death of Berio's friend and colleague Bruno Maderna, is an unrelenting, atonal lament, a vocal setting of excerpts from various poems that Maderna had used in his own work. Hellekant gave an impassioned performance, punctuating her long vocal lines with the bells, gracefully placed by waving her arms or by balancing on one foot to kick a pointed toe. 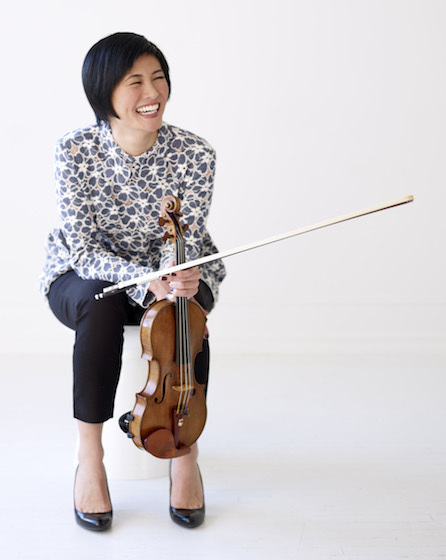 Violinist Jennifer Koh gave an energetic and committed performance of "Anahit" by Giacinto Scelsi, accompanied by an orchestra of about 20, led by Dudamel. This is a piece for those who hear about 24 tones between octaves, rather than the conventional Western 12 tones. It begins with a low buzz reminiscent of truck horns in heavy traffic. With the solo violin is re-tuned to G-G-B-D, the piece plays on the tension of seconds, two consecutive notes played together to create a dissonance, a collision of differently-vibrating sound. Played as double-stops in the violin, these notes also slide to quarter-tones and microtones, the notes in-between that can sound out-of-place to Western ears. The cadenza was an exploration of these dissonant intervals, played as double-stops or brought out in a brittle vibrato. Without anything that could be called a conventional melody, the orchestra slides in and out of sounds that flirt with consonance but always slide into dissonance. Violinists Jennifer Koh, Nathan Cole and Bing Wang, before the concert. Photo courtesy Nathan Cole.